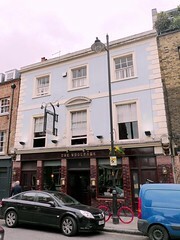 Pub on Bermondsey Street, near London Bridge Station. According to the Aug/Sep 2016 London Drinker, the Woolpack was acquired by Young's in Spring 2016. We haven't visited since, so some of the below may be out of date. bob and others visited at about 1pm on a Thursday in July 2010. While inside was mostly empty, the beer garden was already quite busy; we did manage to find a table outside though. The beer garden has about 20 picnic tables. The seating in the bar is alcovey and mostly fixed, and the bar is quite dark. bob had the haddock and chips (£9.50) photo. This was a very well cooked piece of haddock and some very good and large chips with their skins still on (though they were pre-salted). Even the mushy peas must have been good, since I ate them. The others had a chicken sandwich (£8) photo and a steak sandwich (£9) photo. The steak was not overcooked and of a decent size and still quite juicy. A pint of lemonade and lime was £3. bob also had a decent pint of Caledonian Nectar. There was one other real ale available. A commenter on this page informs us that as of May 2011 wine is £7-8/glass, but neglects to say how large a glass this is. As well as the standard menu photo as of July 2010 there were four daily specials on a chalk board next to the kitchen. As of July 2010, the kitchen is open noon-3:30pm and 5pm-10pm Mon-Fri, noon-10pm Sat, and noon-9pm Sun. Last visited by bob, 8 July 2010. Food times determined on that visit. Opening times taken from the Woolpack website, July 2010. Last edited 2016-08-02 16:27:23 (version 20; diff). List all versions. Page last edited 2016-08-02 16:27:23 (version 20).